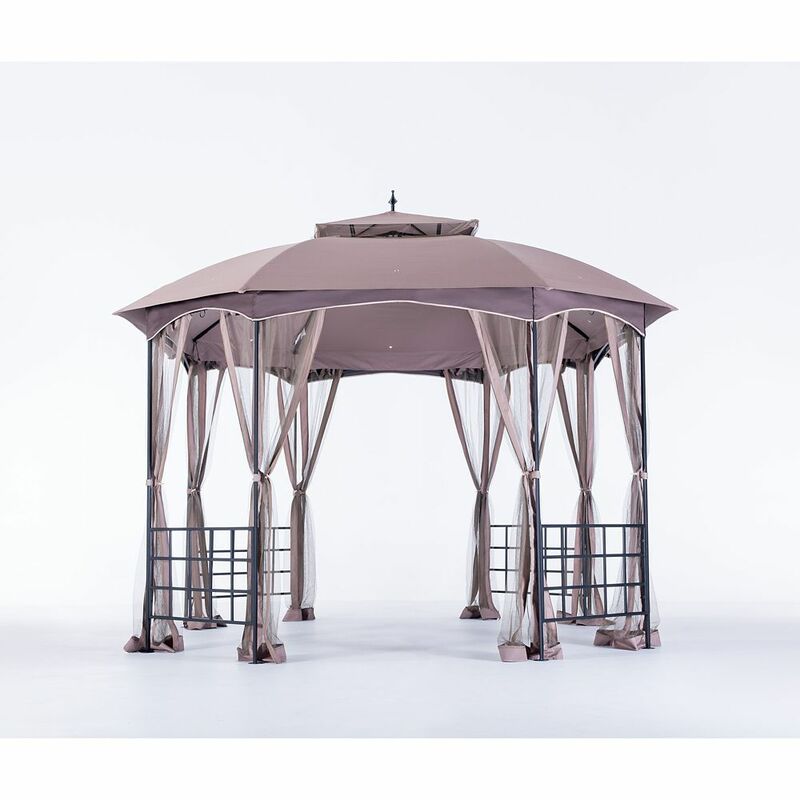 Define your outdoor living space with this gorgeous garden gazebo. The solar cell situated on top of the gazebo charges throughout the day to allow the LED lighting to add a gentle ambiance to your evening gatherings. This model also comes topped with a water- and UV-resistant polyester canopy for 100 sq. ft. of coverage. Mosquito netting ties up when not needed, or let it down for a bug-free outdoor experience. Cardiff 12 ft. x 10 ft. Gazebo with Vented Canopy This beautiful Cardiff Gazebo is designed with the most discerning of customers in mind. It features a simple square-patterned railing and a pointed, two-toned valance with tan piping on light brown fabric that adds to its refined look. Full netting helps keep the bugs out, while built-in hooks provide a convenient place to put hanging lights. Cardiff 12 ft. x 10 ft. Gazebo with Vented Canopy is rated 3.6 out of 5 by 36. Rated 2 out of 5 by Unhappy from There were barely any instructions. You received some direction for putting the sides together an... There were barely any instructions. You received some direction for putting the sides together and some horrible 2 dimension drawings of what the top looked like assembled with no direction on how ti put the top together. Then absolutely NO direction on how to pit the top covers on. It took multiple tries to get the top together correctly. Rated 3 out of 5 by Susie from Looks good like the size. but not easy to assamble... Looks good like the size. but not easy to assamble , take 3 people to build it in 2hour. Rated 4 out of 5 by Jacob from It went together fairly easy and seems to be constructed... It went together fairly easy and seems to be constructed well. Rated 1 out of 5 by Gpmz from Very dissapointed with the company (Sunjoy)! As far the actual product I gave it 1 star for qual... Very dissapointed with the company (Sunjoy)! As far the actual product I gave it 1 star for quality/price. See shipping damage on picture. Rated 3 out of 5 by HomeDepotCustomer from We bought this one to replace on that crashed in... We bought this one to replace on that crashed in a storm, hopefully it will last longer.